Looking for a New Dodge Durango in your area? 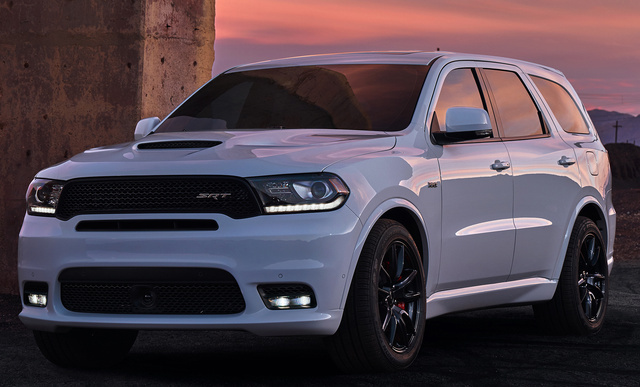 CarGurus has 2,494 nationwide Dodge Durango dealers with 75,504 new car listings. A new SRT trim coupled with standard Android Auto and Apple CarPlay makes 2018 a big year for the Durango. As Dodge continues to cement its commitment to auto athleticism, it seems no model is complete without a boulevard-bruising SRT trim. This year we can add the Durango to that list, adding 475 hp to the 3-row crossover, but the story doesn’t end there. Dodge was slow to add Android Auto and Apple CarPlay to its full lineup, with only a few models offering it in 2017. 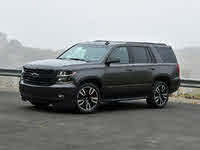 This year, they come to the Durango, which also benefits from a standard reversing camera in a new 7-inch touchscreen. The extra tech is the big news for the average consumer this year, with even base versions starting with a 7-inch touchscreen and reversing camera, as well as Android Auto and Apple CarPlay—meaning you no longer need to pony up for navigation. And while the SRT is getting all the press, some of the more athletic trims get the same front-end treatment, with a new hood and grille with extra vents and cooling for the engine. Starting with the base SXT trim, the $29,995 MSRP gets you RWD, 7-passenger seating, and an impressive 6,200-pound tow rating thanks to a 293-hp V6 engine good for 19 mpg city, 26 highway. You can’t get more towing capacity from a V6 in this category, so it’s not a bad place to start. 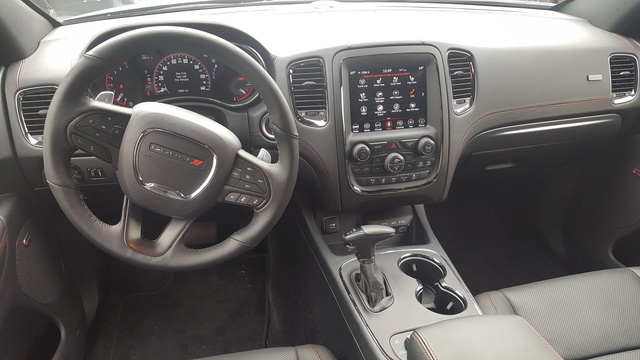 With keyless ignition and entry, 3-zone auto climate control, a load-leveling rear suspension and heated mirror, no one will call it a stripper, but the SXT Plus’ $33,490 MSRP is a worthwhile upgrade for the 8-way power driver’s seat with 4-way lumbar, roof rails, and a rear park-assist system. At $37,795, the GT trim’s power liftgate, remote start, leather upholstery and 115-volt outlet adds a nice bit of luxury to the mix, but it’s the 20-inch alloys, heated front and second-row seats, heated steering wheel, driver memory settings and rear parking sensors that should really attract a crowd. It's a shame you can’t get a trim labeled “GT” with the V8 engine, however. The Citadel offers more luxury for its $42,145 MSRP, with more upscale options like auto wipers and high beams for xenon headlights, upgraded leather and brakes, more leather around the cabin, a power passenger seat with ventilation for the front seats, sunroof, front parking sensors, a power steering column, an upgraded infotainment system with 8.4-inch touchscreen, and a 9-speaker stereo with HD Radio and a subwoofer. But if you’re after some power as well as luxury, you can add the 5.7-liter V8 engine from the R/T trim for an extra $3,995, bringing the starting MSRP for a V8 Citadel to $46,140. But to really take advantage of that V8 power, the R/T gets you a sport suspension, the SRT’s hood and grille, upgraded steering, LED fogs and best-in-class towing of 7,400 pounds. The aesthetic updates continue on the inside with red accent stitching for the embroidered R/T seats and a Beats audio system as well. However, if you want the sunroof and roof rails like you get with the Citadel, you’re going to have to pay extra for them. In fact, there’s a lot you can pay extra for here, so be careful when it comes time to start checking off options. 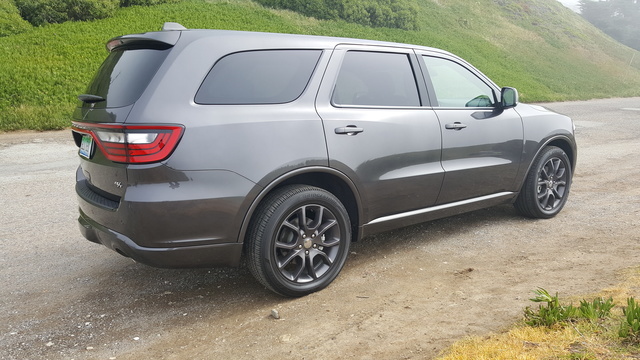 My week with the Durango was spent in an R/T all-wheel drive (AWD) that started at $46,295, and the price quickly jumped up with the $1,195 sunroof, $995 hand-wrapped dashboard with more contrast stitching, $995 second-row fold-and-tumble heated captain’s chairs, $495 second-row console, $995 towing package, $1,995 rear entertainment system and the $2,495 Technology package for adaptive cruise with auto braking and brake assist, blind-spot monitoring with rear cross-path alert, a full-speed forward-collision warning system and a lane-departure warning system. With the $1,095 destination charge, my walkaway price came to $56,555. The Technology package can also be added to the Citadel trim for the same price or the GT for another $100, and the rear-seat entertainment system is also available for all three of these trims. A $2,395 Premium Group package can also be added to the GT for the Beats audio system, sunroof, roof rails and a Sirius subscription, while a Safety/Security & Convenience Group package will add auto high beams with auto leveling, blind-spot monitor with cross-path alert, low-beam HIDs, rain-sensing wipers and a power steering column to the GT for another $1,495. AWD can be added to any of these trims for $2,600, but the top-tier SRT’s 6.4-liter V8 can be handled only by distributing its 475 hp and 470 lb-ft of torque to all four wheels. The situation is further helped by an adaptive suspension and sport steering tune, electronic limited-slip differential and the SRT Performance Pages that I honestly wish was available with the R/T as well. A unique addition here is a free driver’s session at the SRT Track Experience at the Bondurant Racing School. Sadly, the $62,995 MSRP doesn’t include options like the sunroof, and you still have to add the Technology Group and the rear entertainment system if you want those features. You can further upgrade the leather and add an SRT Interior Appearance Group for carbon-fiber trim, the hand-wrapped dash and a soft-touch headliner for $1,500. With three powerful engines starting with a 293-hp V6 and ending with a 475-hp V8, the Durango is no slouch whether you’re towing, touring or taking turns at the strip. Each of the three will get you best-in-class tow ratings, and all but the SRT return some contextually impressive fuel-economy numbers. 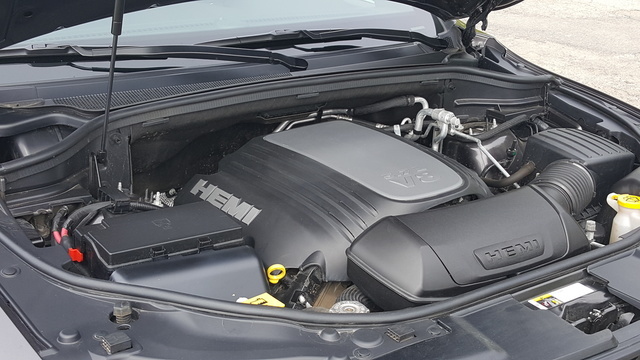 The SRT’s 6.4-liter V8 gets you an astonishing 8,700-pound towing capacity, but returns only an estimated 13 mpg city, 19 highway. Just a few years ago, that would’ve been impressive, but the field has shifted quite a bit, and anything under 20 is starting to disappoint consumers, even with power numbers like this. Still, I doubt many who go for the SRT will be counting miles per gallon while they hit 60 mph in less than 5 seconds. If that kind of power seems excessive to you, the 3.6-liter V6 offers a stout 293 hp and 260 lb-ft and best-in-class towing at 6,200 pounds. Its 19 mpg city, 26 highway, is impressive, but the V6 can feel taxed at times from the Durango’s 5,000-pound curb weight, not to mention when you start hauling things around. For this reason, I feel it’s a shame the R/T’s 5.7-liter V8 isn’t an option for all trims. It’s an impressive mix of old and new with features like direct injection and cylinder deactivation helping it achieve 14 mpg city, 22 highway, despite its 360 hp and 390 lb-ft—numbers that help deliver its best-in-class tow rating of 7,400 pounds. And despite my rather heavy right foot, I was easily able to hit the estimated 17 mpg combined in my week of mixed driving, and that’s a rare occurrence in my testing experience. I do have a small contention with the steering and suspension, however. The sport-tuned suspension you get with the R/T was the perfect complement to the ample power the car was able to put down, but I can see some buyers finding it slightly stiff, especially if all you’re carrying around is a few kids. The SRT’s adaptive suspension cures this, but of course that’s available only on the top-tier trim. 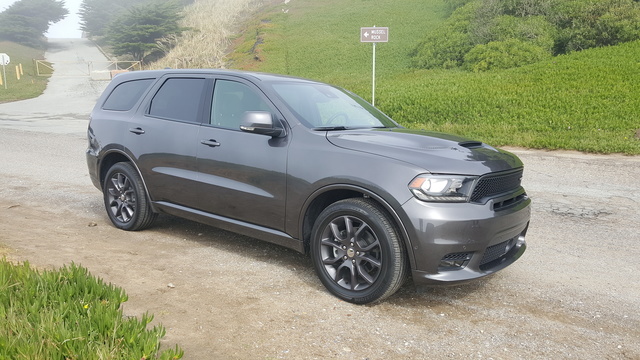 Opening up the suspension and engine options to the whole lineup would really ignite sales for the Durango, as I can see many people willing to pay for the V8 in lower trims or wanting a softer suspension and ride in the R/T. Still, the fully independent, rubber-damped suspension makes the Durango feel much lighter than its 5,000-pound curb weight would suggest. Among 3-row crossovers, finding actual rear-wheel-drive (RWD) construction and V8 power isn’t easy, but the Durango offers both and at a competitive price. Even better, it doesn’t cut corners in interior space or design, and the cabin is an attractive, comfortable place to spend time, front or back. Pay close attention and you’ll notice the rotary dial for the transmission has been replaced in favor of a more traditional gear lever this year. I find this a shame, as the rotary was a much cleaner approach, but truck people love tradition. If Dodge were ever to put a column shifter in the Durango, I’m sure people would be celebrating coast to coast. With 7-person capacity, 47.7 cubic feet of storage behind the second row and total storage of 84.5 cubic feet, the Durango remains competitive in the segment, with only the Traverse offering more space inside. 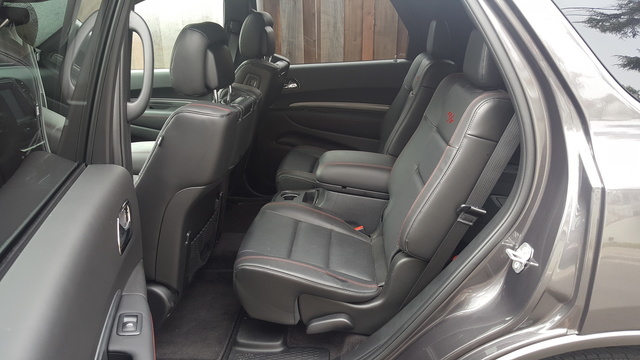 My Durango was outfitted with the second-row fold-and-tumble heated captain’s chairs, which drop passenger capacity down to 6 but make climbing into the third row a breeze with true one-hand operation. I can’t really see dropping the cash on the rear-seat entertainment system and feel a lot of families will find rowdy kids and delicate screens aren’t the best blend. It’s a good place to save some money—better put it toward safety systems or the sunroof. Regardless of how you look at it, the Durango is a 3-row crossover that handles nothing like a big truck, can haul around 7 people and can tow just about anything you can manage to hook to it. The fact that it’s fun to drive and looks great are just bonuses to this already-competitive recipe. That said, it's still working with a design that debuted in 2011, and some consumers are finding this less than fresh. Personally, I think it's still one of the most attractive options in the segment, though it's worth considering a redesign is certainly on the horizon. As much attention as the SRT is getting, the addition of Android Auto and Apple CarPlay is bigger news for 2018. Buyers no longer feeling restrained by picking a trim that includes navigation means a lot more people suddenly open to considering the Durango. Add a newly standard reversing camera and a standard 7-inch touchscreen, and it just gets better for anyone looking to spend less than 40 grand. I also like that even at the top trims, the more advanced safety systems aren’t automatically included—meaning a lower starting price—but at $2,500 for a list that doesn’t include all the best options in this category, I think a lot of buyers are going to be turned off by the prospect of inflating their purchase price. Same with the rear-seat entertainment system. It’s a fun unit with all the options I’d want from such a system, but I think it’s just a few years behind the times to be relevant to most children and parents. More than half the small kids I know already have their own tablets, and they get attached to silly things like that to the point of their preference obviating change. 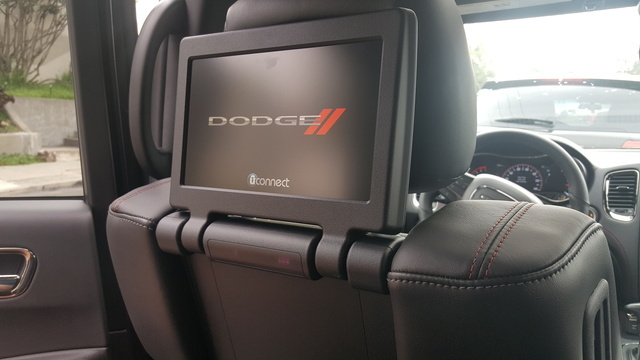 Couple that with the fact that the DVD/Blu-ray player itself is located in the center console, which means you lose nearly all your front-seat storage, and I don’t see this being a winner for Dodge. Otherwise, the Uconnect system is an attractive and responsive interface. The only complaint I had was with the navigation system, which always seemed one step behind where I needed it to be, either telling me I needed to turn far too late or telling me to take the “next” turn when my actual objective was two or even three turns ahead. That said, with standard Android Auto and Apple CarPlay, this is a situation that can easily be avoided. Four-wheel antilock discs; stability, traction and trailer sway control; and a full suite of airbags including front side, driver knee and full-length curtain airbags mean the Durango has earned a 4-out-of-5-star safety rating in National Highway Traffic Safety Administration (NHTSA) tests, with side impacts getting 5 out of 5. Independent evaluations did even better, as the Durango achieved top ratings in all tests. Braking distance from 60 mph could be better, but it’s still competitive at 125 feet, with Citadel and V8 trims getting upgraded brakes to handle the extra weight. One aspect that could be easily ignored is that the sport suspension in the R/T and the SRT’s adaptive suspension alike should reduce the likelihood of a rollover. If you’re looking for V8 power in a crossover, you simply can’t do better than the Durango. Even with the V6, it offers best-in-class towing, but if you’re okay with a V6, there are better, lighter options on the market that will offer advantages in fuel economy, handling, and general wear and tear. If Dodge ever decides to make the V8 available to the GT and SXT trims, I think it’ll have a hard time building enough to meet demand. Until then, take a ride in an R/T and see how good the crossover life can be. What's your take on the 2018 Dodge Durango? TheHorror Do you dress yourself, Perkins? Have you driven a 2018 Dodge Durango? Enter your zip to see incentives for a new Durango in your area. CarGurus has 24,379 nationwide Durango listings starting at $1,900. What type oul do i use for 2018 dodge Durango?